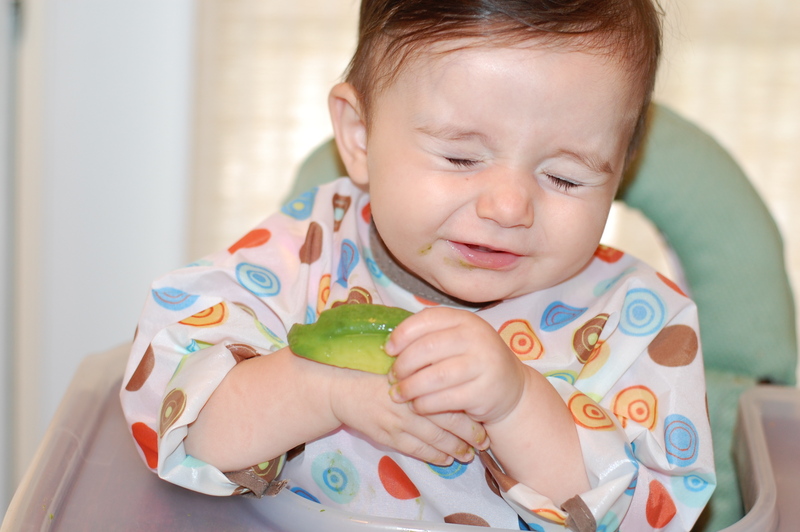 I fed Sugarpie yogurt and avocado for breakfast. Yes I spoon fed. I just do not want my kitchen decorated in a shade that went out with the 70s. But for dinner, we had chicken curry. It had a coconut milk base and the chicken was fall-apart tender. I’m really trying to offer some different flavors so that she is exposed and hopefully open. It was a hit. Better hurry as in, better hurry up and GIVE ME MORE, MOMMY! 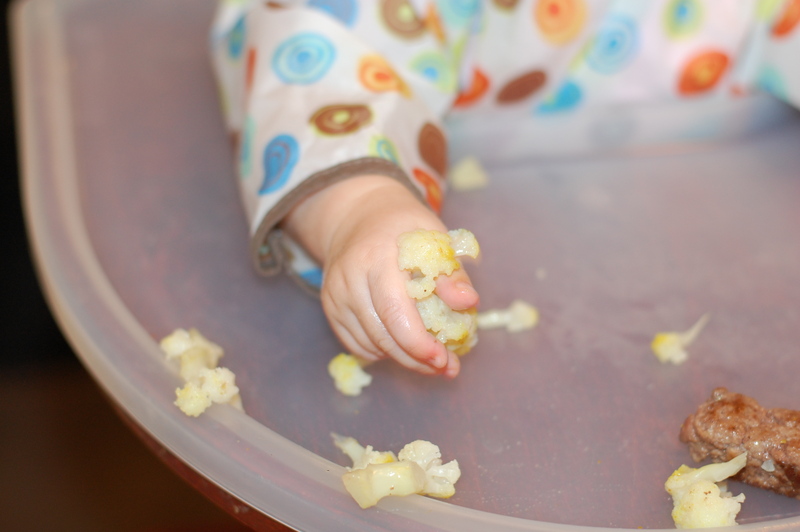 After two days of cauliflower ambivalence, I’m glad to see her lapping something up again. Sugarpie went for one handful after the other. 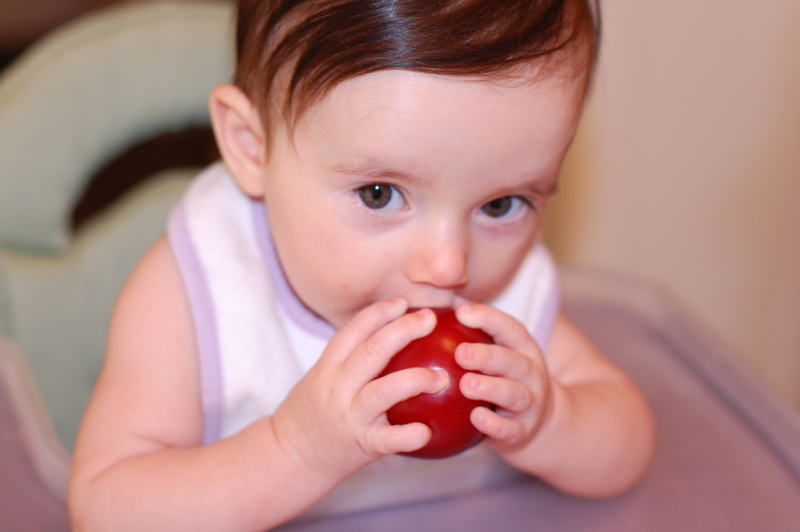 It was the perfect texture for her as she can’t really tear and grind without molars. It was so easy, I put all of the ingredients in the Crock Pot and let it go! Do NOT touch my food, Mommy. Heeding the doctor’s advice that I should feed Sugarpie a little meat for iron, I decided to go with something easier for her to break down and gave her ground beef. Instead of a patty, I made her a hamburger “stick.” It was in a form that she could grab and get to her mouth without having to open her fist. Opening her hand to get what’s inside is a skill she is approaching, but she’s not there quite yet. Wow. Babygirl really does love some meat. I was afraid that she was too ambitious with how much she shoved in her mouth so I tried to take it from her. She yanked her hand back! Then, as she opened her mouth once, a piece almost fell out but she saved it by poking it back in. I gave her steamed cauliflower with a little curry powder before the meat. She ate it, but it was a tepid response. The most fun came from breaking the pieces apart. But the meat, that was the winner of the night. 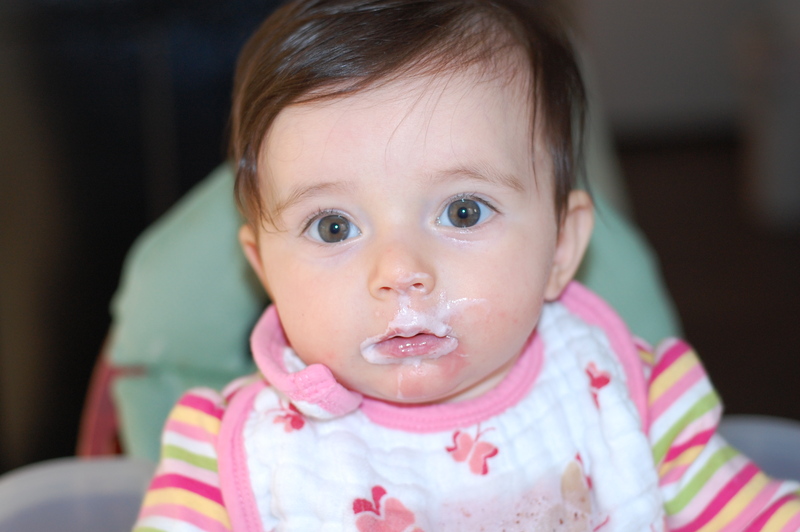 For mid-morning meal, we had yogurt with smushed-up nectarine. She at it all, probably 2 ounces worth. For dinner we revisited the cauliflower. Again, she ate some, she played with some. I withheld the hummus on toast sticks because I knew that the cauliflower would only wither in the shadow cast by the glorious hummus. After some ambivalent munching on the veggie, she got the toast. Look out world! Sugarpie gummed the toast and sucked the hummus from the pieces. 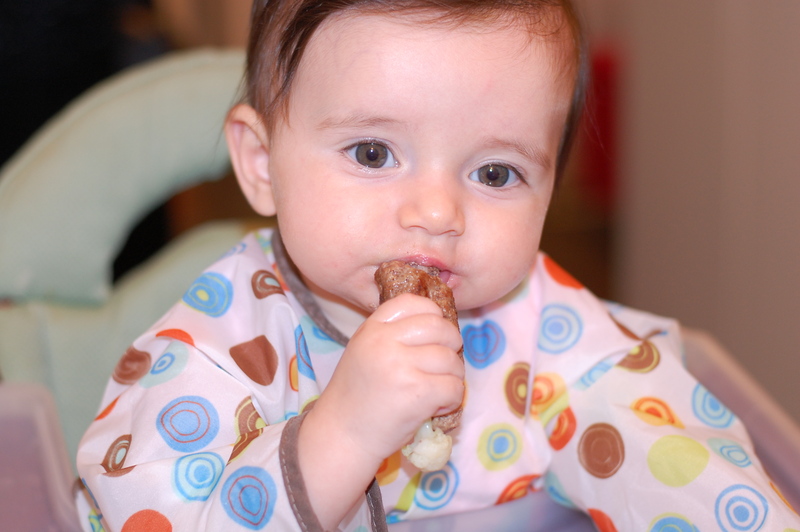 By the time the toast was good and soggy enough for her to get a piece in her mouth, it was of an ideal texture. After the failed first attempt at yogurt introduction, I decided to try a milder type and dress it up a little. I still bought plain yogurt (Mel Brooks, you listenin’? ), but I smushed up some blueberries. Look out world, ’cause that was the ticket. I gave in to a spoon-feeding Sugarpie because this yogurt was kind of runny. I was not in the mood to spend the rest of my life picking blueberry bits out of the window dressings, not today. Since I barely spoon-feed her, I am assuming that we’re not derailing any progress. I make sure that she wants it, and if there’s a hint of hesitation I let it go. But believe me, there wasn’t much hesitation. For dinner, we tried a cucumber spear and some strips of Swiss cheese (remember, this type is far lower in sodium). She was underwhelmed by the cucumber and excited about the cheese. No gagging today! First attempt…as soon as that top tooth breaks through, we’re in business. I bought a beautiful plum today…it practically jumped out of the box. I gave it to Sugarpie whole to see how she would react. She picked it up, gnawed it to no avail, and chunked it. Repeat 3x before Mommy decided to help. 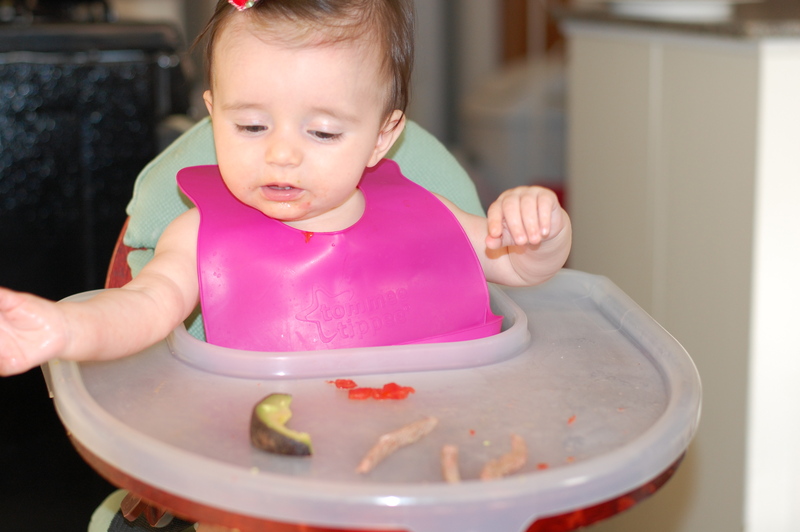 I cut a thick slice and put it on her high chair. She made a sour face, but went back for more. The pulp was separated from the skin with her tiny teeth. We did this with 2 more pieces. She loved it! She didn’t eat all of them but had fun chewing at the bits hanging from the skin. At some point, she should be able to tackle a whole one. 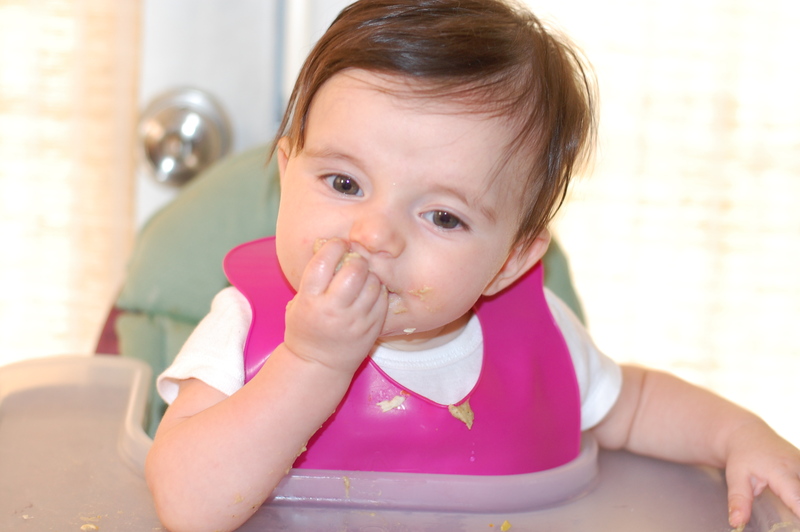 She started to get fussy, so I gave her a taste of baba ganoush…wow! Loaded with lemon juice and garlic, she smacked her lips and wanted more. I put a teaspoon-size blop on her tray, and suddenly she had Technicolor chicken. 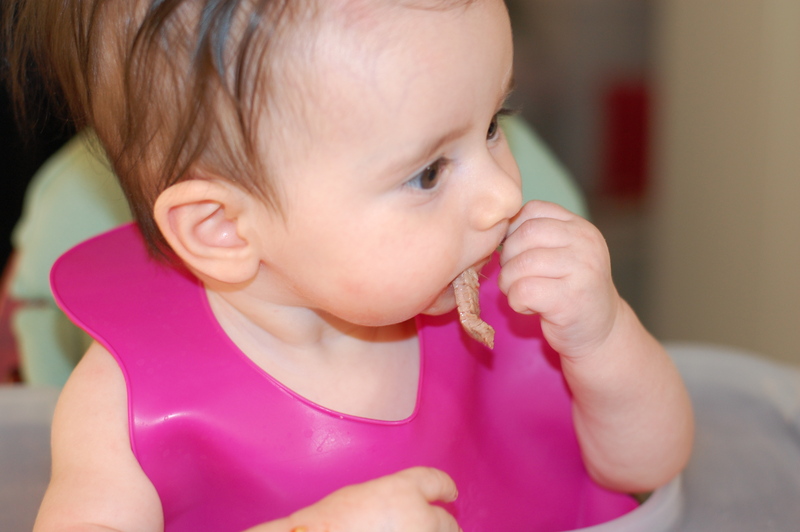 She licked bits of the baba ganoush off of her tiny fingertips and dragged the chicken through it as well–the chicken was suddenly much more attractive. Not wanting to give her too much as eggplant can sometimes be a little bit irritating, I peeled a beautiful Sungold tomato wedge for her and she munched away at half. But she’s not shy in letting us know when she’s had enough, so we shut it down when the fussing started. There was baba ganoush EVERYWHERE. 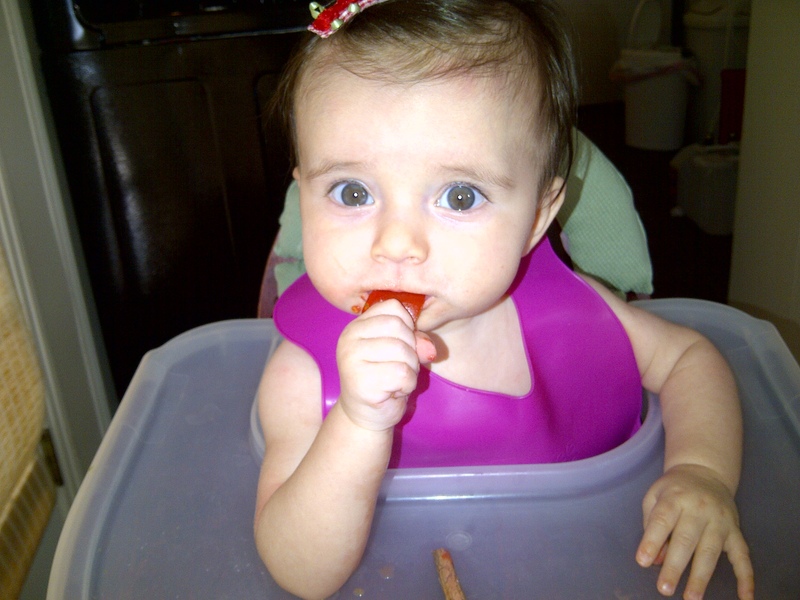 Her little hands were coated in it and she really wanted to touch Daddy’s head with her baba ganoush-y hands. Ew. Daddy whisked her away to the bath. Can you imagine a 4 year-old tucking into a brown bowl of eggplant spread? I can’t, but I certainly hope that with early exposure, Sugarpie will keep the same eager and open mind that she has now. **On a safety note, I recommend checking your baby’s mouth before bed time. Sugarpie had a smooth piece of tomato stuck to the roof of her mouth and, for obvious reasons, we did not want to put her to bed that way. A lot of her food seems to end up there, but I imagine that this will get better as she gets better at chewing. We just cut it into thin mini-strips. It’s very manageable. Today we had more steak with avocado and tomato. Our tomato supply is out of control right now. We keep getting Sungolds, regulars, and golden cherry tomatoes from our CSA. It’s all organic, local, and delicious. Sugarpie agrees. Georgia played with the steak a little bit and threw the avocado overboard, but she was really digging the tomato. She had a hard time with the skin making it stick to the roof of her mouth (it’s kind of a common problem with her), but she kept going back. Before long, Sugarpie was doing the I’m-going-to-try-to-straighten-out-my-body-in-protest-to-staying-in-this-highchair-one-more-minute thing, so I took her out and cleaned her up. 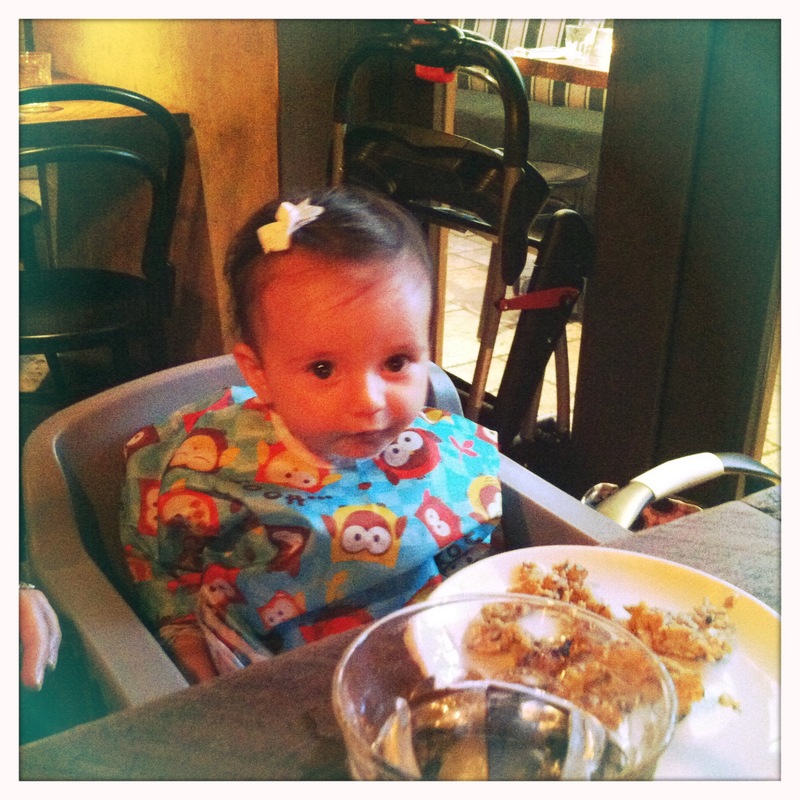 We sat down at the table and the plate that I was feeding her from was right in front of her. I offered her a small piece of steak with my fingers and she happily munched away at it. All went down, even though it was about 2 sq cm worth. She grabbed for the tomato so I helped her with that. She ate it out of my hands with gusto. She scraped the pulpy bits off with her tiny bottom teeth eagerly. Who knew?! She loved it. A girl’s gotta have options. Sugarpie will try EVERYTHING that we put in front of her. It’s is probably pretty normal at this age, but I’m glad we can exploit her adventurous side. Her rejections come in the form of things she used to love (mango, for example). She’ll just scrinch up her little nose and turn her face. She loved it once, though. We’ll come back to it!